1888, Whitechapel, City of London. Five women have been brutally slain. The murders are so heinous that many couldn’t stomach the sight of the mutilated victims. Twenty-one year old, Oliver Montgomery Beckett found his handiwork to be anything but repulsive. He was better known as Jack the Ripper. He meets a man named Freddy who is immortal, having lived hundreds of years. Oliver serves his master, doing the killing in Whitechapel so Freddy has a source of fresh blood. The killing of a constable forces Oliver and Freddy to flee England. In The United States Oliver has changed his name, now calling himself Jonathan. Jonathan makes his way to Michigan’s Upper Peninsula. A freakish accident has him at death’s door. Before he dies Freddy gives Jonathan some of his blood, turning Jonathan into an immortal being. As time slowly passes, Jonathan becomes aware of abilities he never knew he had, the most striking of which is the power to awaken the dead. Once awaken the walking dead serve Jonathan. In an epic encounter, Jonathan faces his old master, Freddy. For the first time in his extended life, Freddy becomes frightened when he witnesses Jonathan’s powers. Freddy finds he has no control over his former accomplice. Feeling as though Freddy had abandoned him, Jonathan unleashes unimaginable suffering on his former mentor. Car boot sale ad details The Blood in the Darkness novel for sale in London. 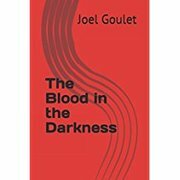 The Blood in the Darkness novel available on car boot sale in London. More Fiction books for sale in London and more second hand sale ads for free on 2lazy2boot - London car boot fairs - 38652.